I heard once that an airplane never flies perfectly on course. It has a path, yet the winds will blow, the machinery may not perform perfectly and it will veer a bit one way and the pilot will bring it back centered, then it will veer another way and the pilot will bring it back on course. The same is true for us in our lives. We don't need to feel guilt when we veer off balance -- we will simply recognize it and bring it back. Occasionally in our efforts to balance, we sway back too far and end up off-balance again. It happens! Once again, you'll assess, see the need to swing back a bit and get back to where you need to be. This is what we do in life to attain balance and to enjoy a healthy happy life. Balance poses in yoga are beneficial to the body, but can also teach us the principles in finding balance in life. During our Better Balance Challenge this month, we're going to deepen our understanding of what Balancing can do for us and how to best achieve Better Balance in our lives. We're not striving to be statues -- to stay completely still at what we imagine our optimum to be -- instead, we will rock back and forth, finding a better balance in each moment as we guide our bodies and minds to be aware and strong enough to sustain equanimity. It's going to be fun and rewarding! Namaste! "What to you does it mean to do yoga?" I want to share my response with you. I love a variety of approaches to physical fitness -- kickboxing, weight training, step cardio, interval training, spinning, kettlebells, Pilates. But yoga has reached in and touched me more deeply. For that reason, I've loved teaching it and have longed to share it with others. For me, to do yoga is to explore my body and my mind simultaneously. There are many forms of exercise that I love, but none of them resonate with me beyond the practice like yoga does. 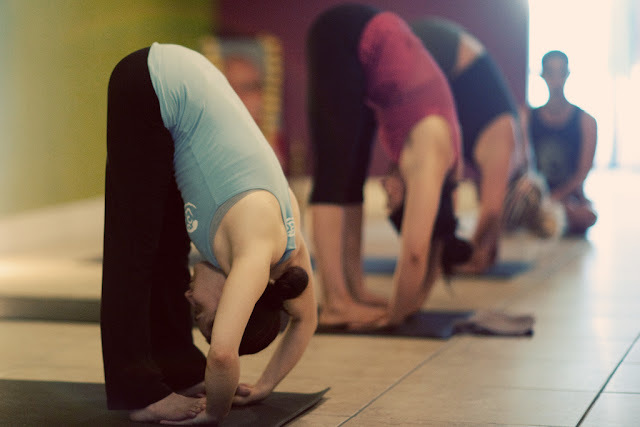 When I do yoga, I am able to release my mind throughout the asanas (postures) and through the breath. I am able to explore where my mind tends to go and either redirect or or loosen it. This is quite a freeing experience for me and I always enjoy it. It separates me from my usual day and my usual thought patterns. At the same time, I am able to find postures that challenge me, make me push myself in ways that I don’t always welcome, and discover that I can do more than I realize. I also find much pleasure in the release of postures that increase flexibility, especially in seated hip openers and back bends. And I find joy and peace when I allow all of the postures to resonate in my body in that blissful final resting pose. But after the yoga practice has come and gone, yoga extends beyond the mat for me. I learn lessons through each experience on the mat that I carry with me throughout the day. I learn to let go when I might normally hang onto tension or unfruitful thoughts. I am able to step away from my thoughts to explore what is happening before I continue to react. I am able to slow my breathing and enjoy the moments of each day much more. I know that many see yoga as a stretching practice and that's part of it. But there's much more. 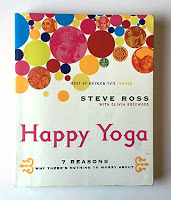 If you haven't clicked with yoga in the past, try another class with a different teacher or try one of the many dvds that I love (or one that you may discover on your own). You may just find it blessing your life for many years to come. Think back to what first drew you to yoga. Was it because you heard a friend talk about loving yoga? 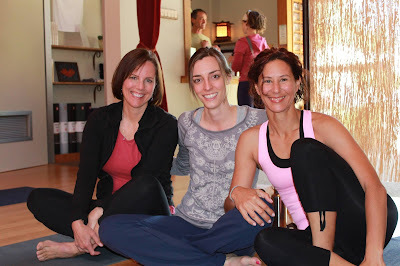 Was it a desire to see if yoga could help you recover from an injury? Was it the hope to relieve stress in your life? 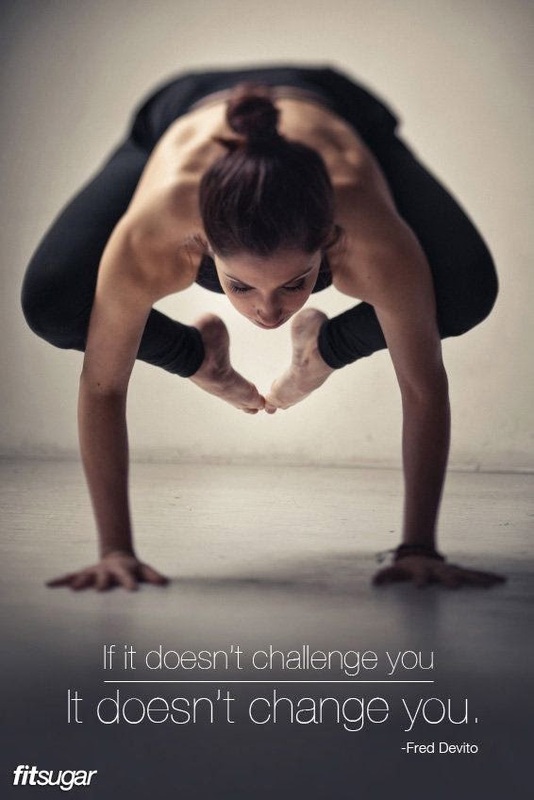 Was it to give your body more flexibility? Was it to help you become more calm and less reactive? Was it simply from a spark of curiosity? With all the options and methods available to grant us excellent health, fitness or wellness, why choose yoga? Unlike all the forms of exercise that tout "before" and "after" photos, yoga does something for our bodies that is so internal, so powerful, that it has to be experienced to be understood. And once you tried yoga, did it take you long to understand just how wonderful it can be? I first tried yoga in 1999, I didn't know of any benefits to yoga. I did fitness videos every morning and started to see yoga videos come on the market. I thought I'd be bored if I did yoga, so I avoided it for awhile. Then I bought an exercise video that had 20 minutes of yoga at the end. 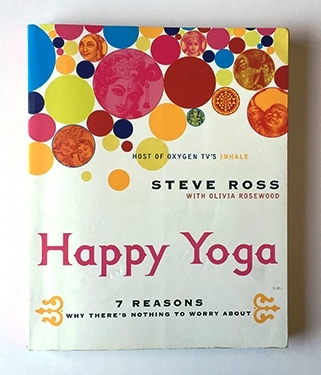 It wasn't a chaptered DVD that I could easily just skip through, so I did the yoga. I distinctly remember falling in love during triangle pose. I savored the various sensations within that pose and felt thoroughly soothed. And by the end of that short yoga practice, I wanted to do more yoga. I found that I left the mat feeling altered (in a good way!). I had a little more understanding about who I was and how I related to my body and how I could better respond to the rest of the world. "You're not fat (and neither am I)"
So when you say "I'm fat," . . . Is that who you really are? Of course not, but it is an identity that you've bought into and the more you buy into it, the more miserable you become. You could insert any description of your body into that identity. "I'm short" or "I'm not flexible" or "I'm impatient." While that may be a description of your body, you are not your body. This is one of the many lessons that you learn by doing yoga. You could study yoga philosophy to learn about this principle further -- the story of Ashtavakra is one that teaches this clearly. Or you could step onto your mat, do some yoga and experience it deeply for yourself. When you do physical yoga, it's a means of helping you separate your inner being from your body and from your thought patterns so you are free to focus on deeper matters of existence. Some call this the quieting of the mind. Others simply call it bliss. Once you experience it, you will be drawn to come back to the mat again and again. You will have a greater understanding of the yogi salutation "Namaste" which is a recognition and appreciation for the essence or divine light from one to another. Yoga helps you tap into that awareness of the internal power we all have. When we are able to separate ourselves from our bodies and even from our thoughts, we are able to see our true essense, the divine light within ourselves, and we are better able to connect with the source of that light. As I conclude thinking about each of you and your inner light, I am filled with joy and peace. After I do yoga, I feel different than I do after completing any other kind of workout (and I love many different kinds of workouts). Most of this is due to how I feel emotionally and mentally. I come out of yoga feeling rejuvenated, restored and at peace. I feel like yoga has healded me in some significant way, even if just for that day. Over time, yoga can provide multiple healing benefits for the body. This doesn’t mean that all of yoga is stressful, but as in life, stressful moments occur (whether it’s from the pose you are attempting to do or the thoughts that are running through your head that you'd like to release). Our brains tend to react to stress automatically with increased heart rate, faster breathing, muscle tension, and elevated stress hormones. Yoga teaches us to react to stress in a healthier way by slowing down the breath to relax the muscles, lower the heart rate, and soothe the body. We learn to be calm observers of what is happening in the body. Being aware of what happens in your mind and in your body will give your spirit the opportunity to guide your body to relax and heal. Yoga provides an opportunity for paying attention to what is happening in your body at the present moment and for calming the mind. Meditation works in the same way. 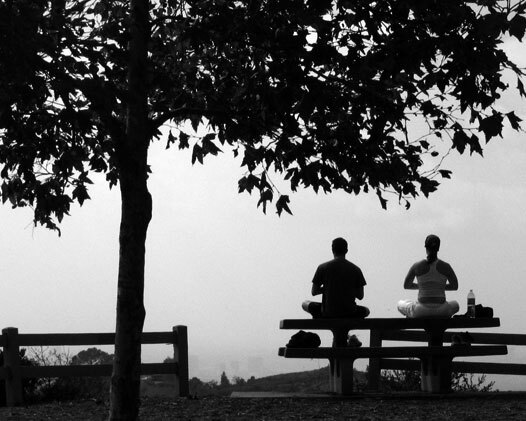 Meditation isn't about sitting still and doing nothing. It's about keeping yourself seated when you feel restless. It's about telling your brain not to wander or worry. It's about being patient with yourself as you go. Yoga is meditation in motion. As you take your experiences on the mat into your daily life, you will find your brain rewired to respond to thoughts and stress in new ways -- ways that lead to happiness, healing, and peace within. Facing Fears & Doubts through Yoga . . . I'm no psychologist, but I've learned a few things about my doubts and fears while doing yoga. First there's the obvious that yoga teaches you to slow down your breathing when it gets tight or constricted, which relaxes the body and helps you with whatever is restricting your breath in the first place. I have done that in moments of great fear. For example, several years ago, when I was up high in a ski lift, I realized how afraid I was of the height -- I was shaking like crazy and was gripping the rail like I was going to die -- heart beating fast and out of control. I told myself that while I couldn't get down from the ski lift, but I could slow down my breath and relax my grip. I made myself open my hands slightly so my body wouldn't be so tensed up. And I made myself consciously breathe more slowly. That eventually led to me relaxing in my thoughts and made me adjust to the height -- amazing! Relaxing the body in order to relax or change the thought patterns is one approach to conquering fears. Another thing I've recently learned in my yoga workshops is that I tend to send thoughts of doubts and fears to myself more often than I realized. I tell myself that I'm too old to do something and that I can't when others are diving in and aren't afraid. There have been some poses introduced that I think will make me collapse on my head, flatten my face, and break my neck. Who wants that? I tell myself that my arms aren't strong enough, my torso is too long compared to my lower body, I'm too heavy, or that I'm just not as young as I used to be (well, I think everyone can fall into THAT category!) But then I'll look around the room and everyone else would be trying it. Why am I so afraid? In these instances, I've had to tell myself that perhaps my thoughts are incorrect. I may be JUST the right age for doing that particular pose. Or my body may be completely equipped to do it -- I just have to learn to "ride that bike." I tell myself to have trust in my teacher and listen to what he's telling me to do. One day, Mark Stephens asked us to do Sirsana 1 pose, which is the headstand where you rest on your elbows. 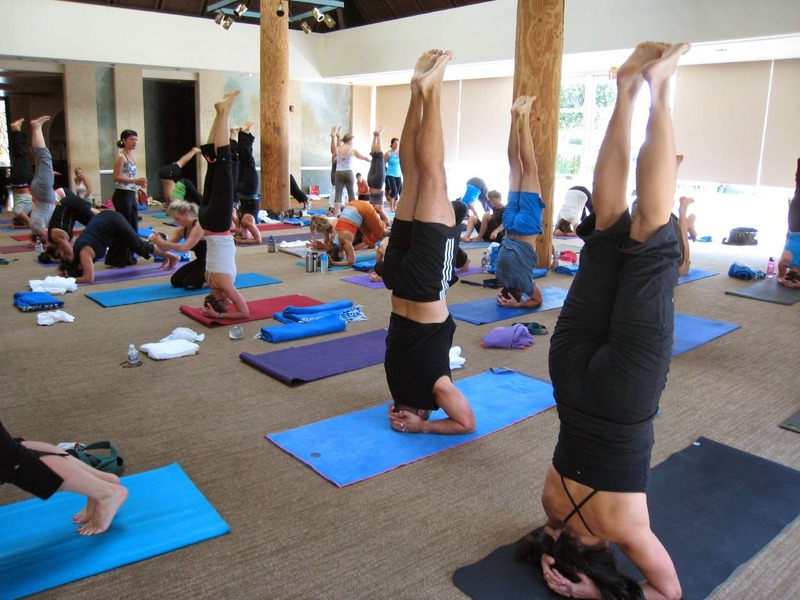 I have been doing tri-pod headstands (Sirsana 2) for many, many years and an can stay up seemingly forever. My body knows it, likes it, and is very comfortable there. But the few times I've tried this yoga headstand that I've seen over and over in yoga videos and books, I thought my neck would break! My neck felt very vulnerable and I didn't ever want to try it again. I may have even read something online about someone saying it wasn't safe for the neck, etc. All of these thoughts were swirling around in my head -- fearful thoughts for sure, as Mark was introducing his thoughts to my mind. He told us this was a safer, more supportive headstand. One could stay up in this headstand much longer because it created less stress in the neck. Hmm, really? Could I rid myself of the old thoughts and allow new ones to reside instead? I pondered the possibility while others tried the pose. I approached the wall and finally decided to give it one try. Just one. I couldn't even kick up into that version of headstand. But I had a friend help me. And I could do it somewhat against the wall. It wasn't easy and I didn't hold it for long. I had a few questions and when Mark asked for ?s at the end, so I raised my hand. What does he often have us do when we have a question? Go up and show him our pose so he can see what we are experiencing. And was I to go up against the wall? No. He would be there to spot me on the mat in the middle of the room in front of the rest of the class. I had a little fear of falling over or hurting my neck, but had seen him spot others in Dolphin handstand before, so I knew he would keep me safe. But my legs had a hard time even getting up or staying up, despite my efforts. My fears of breaking my neck may have been gone, but my doubts of my abilities to figure this out were HUGE. But Mark told me it was just a matter of getting my body aligned and properly stacked. He told the class that for some, it may take a year or more to get this pose, but he could see me able to do this pose in just weeks. WEEKS!, he emphasized. My doubts were starting to melt. Mark has over 20 years experience teaching. He must know my abilities much better than I can see them. I was determined to practice. I practiced in class with 2 friends spotting me (still a bit of fear there) and one of my friends told me that my elbows were too far apart. Another told me to lengthen my shoulders away from my elbows. That made a huge difference in my alignment. I went home and tried it this away against the wall. I still couldn't kick up by myself, so I put a block beneath my feet to give me an edge. Once I could do that, I was able to kick up without the block (within maybe a week's time). One night at home, I found if I looked across the room (as I'm sure Mark suggested in class) instead of more toward the floor, my alignment improved to almost what it was in my tripod headstands. Amazing! It's so great to watch the body and mind connect like that. After a few more days, I thought I might be able to do it in the middle of the room without the wall. I was! I did! I was excited to finally be able to do this in class and with my first opportunity to do so, I couldn't do it. I was about 90 minutes into the practice and I didn't have the strength to hold it without the wall. I also think I created some anxiety and instability by building it up so much. But that was okay. I'd get there. And get there, I did! Just a few days ago, I attempted the headstand on my mat without the wall nearby. I did it. I DID IT! Fears gone. Doubts gone. Too old? No way. I can do this now and I love it. I'm excited to see what I will learn to do next -- not just for the sense of accomplishment, but for the ability to strengthen my body in new ways and to be able to re-pattern my thoughts. Love it! 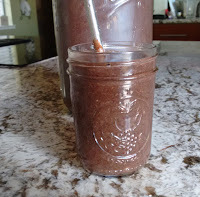 Here's a favorite fall recipe that I morphed from a McDougall cookbook. This recipe is so versatile. I've changed it up when I was out of apple juice and used grape juice instead, which made me think I should use berries to go with that stronger taste. That same day I realized my muffin pan was still at the school, so I made scones instead and they were an instant hit. I liked them because they had that muffin top wonder that tastes so much better than the bottom. So I'll post both recipes and will add at the bottom of each that they can be made into muffins or scones (or even a sweet bread if you have a mini-loaf pan). I've done all of the above. Mix ingredients -- wet first, then add in dry. Pour into muffin pan at 3/4 full. If you'd rather make them into scones, scoop w/ice cream scoop onto baking stone or sheet. Bake at 350 degrees for about 35 minutes. If you make mini-muffins, it will only take about 20 minutes. If you want to make it into mini-loaves, it will take more like 45 minutes. 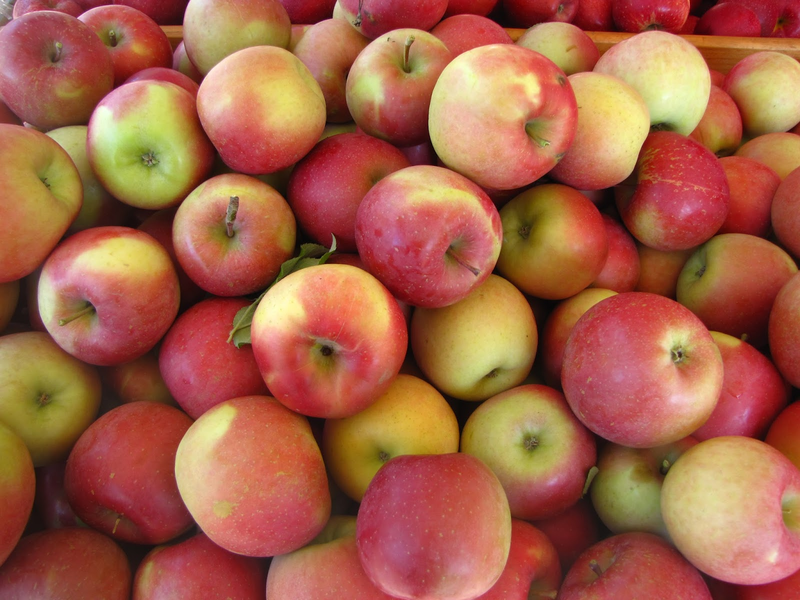 These freeze well to keep fresh if you can't eat them all within a few days. Mix ingredients -- wet first, then add in dry. Fold in berries at the end. 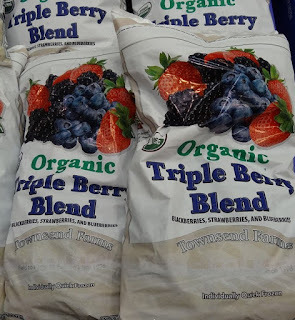 If the berries are fresh, they may come apart when mixing -- you can coat the berries with a little unrefined sugar to keep them together if you'd like. For scones, scoop batter w/ice cream scoop or large serving spoon onto baking stone or sheet. Bake at 350 degrees for about 35 minutes. If you'd like to make muffins, fill muffin tin to 3/4 full. If you make mini-muffins, it will only take about 20 minutes. If you want to make it into mini-loaves, it will take more like 45 minutes. These freeze well to keep fresh if you can't eat them all within a few days. Here are some wonderful sweet bread recipes that I love to make in the fall. This is taken from a Williams- Sonoma Pumpkin Bread recipe, only I've changed the butter to oil, sugar to unrefined sugar and substitute other ingredients for the pumpkin for a variety of breads (all super yummy). I think the magic in this bread is the corn meal/wheat flour mix. It makes for a heavy, gritty, yet sweet bread. And it has less than 1/2 the oil of most sweet bread recipes. My kids love it. Mix wet ingredients first -- add dry ingredients. Stir in raisins &/or walnuts. Pour into 4 mini-loaf pans or 2 full loaf pans. Bake full loaves at 350 degrees for 1 hour (mini-loaves for about 45 minutes). You can also make these into muffins -- bake for more like 15-20 minutes. You can even scoop them onto a baking sheet for cookies -- bake for 8-10 minutes. Apple Pumpkin Bread -- Add 2-3 chopped apples to pumpkin recipe for a wonderful fall bread. 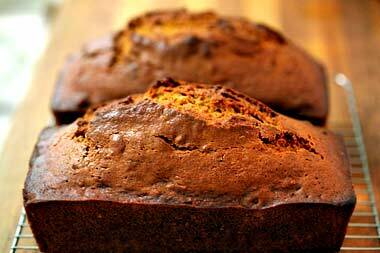 Zucchini Bread -- Substitute grated zucchini for pumpkin. Banana Bread -- Substitute smashed bananas for pumpkin. I usually don't use walnuts for the other breads because my kids don't like them, but I always sprinkle a handful of nuts on top of each mini-loaf of banana bread so I can have the nuts and my kids can have the under part without. It looks pretty that way too. Pumpkin-Zucchini Bread -- I've even combined the squashes to make a Pumpkin-Zucchini Bread (using 1 c. pumpkin, 1 c. zucchini) - - Super Delicious! When I make my green smoothies, I usually use this basic formula in my Vitamix. 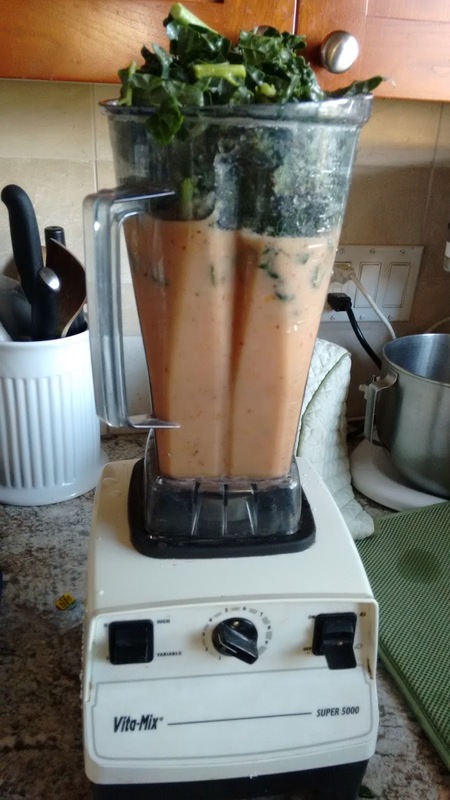 If your blender is smaller, you can adjust the portions. It's always yummy and gives me plenty of dark green leafy greens. Try it! 3 big handfuls of washed greens (kale* & spinach seem to work best -- if you use kale, make sure you tear it up into spinach leaf size so it doesn't get stuck in the blender -- the kale stems are really coarse and you don't want them in there. Collard greens & chard are great, too! 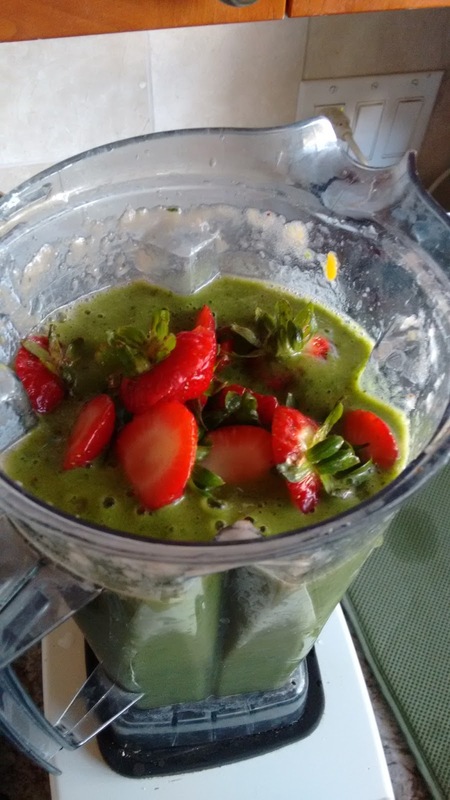 Blend it all up in the order listed. 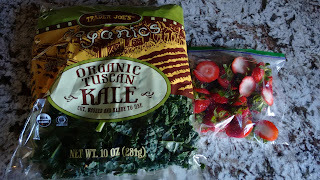 * I like to use the Tuscan Kale from Trader Joe's -- it's already cut and stays fresh for awhile. Drink one glass right away, hand another to a friend and freeze the rest (usually another 2 glasses). It's really good thawed out the next day or even up to a week or two later. I've taken them frozen in a cooler when traveling before and it worked great. .